Audio-Technica's premium professional studio headphones, the ATH-M40s, offer a flat, extended frequency response for professional studio monitoring. Superior components provide very high SPL capabilities while allowing the ATHM40s to maintain exceptional clarity of sound. Exterior design features include sturdy strain-relief cable and comfortable circumaural earpieces that can be rotated 180º to permit one-ear monitoring. The ATH-M40 utilizes 40-millimeter drives with neodymium magnets and copper-clad aluminum wire voice coils for lowest mass. 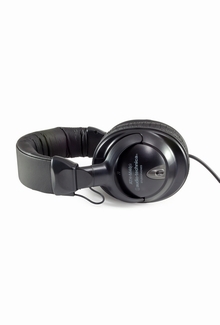 The AT-HM40 headphones are equipped with an 11-foot cable terminated in a standard ¼-inch connector. This field-serviceable model allows elements, cables, and earpads to be replaced in the field if necessary.